Get opportunity to work on Software & Tools for free! Yes our main objective of offering training is to first of all employ that professional and that is the reason our training program is best not just in Jaipur, rather whole of India. Keeping in view the increased number of Engineering colleges in Jaipur, we understand there are not at all enough job opportunities for the students, professionals and entrepreneurs. Contrary to this, if these students are trained properly then they can be a boon for the company. For this reason the training program is developed and designed to let students from any stream get in. Also worth mentioning here, it is mandatory for B.tech, M.Tech, B.C.A, M.B.A and MCA students to take summer training or internship in order to complete their syllabus. So, we provide summer training in Jaipur which is ENTIRELY DIFFERENT from training provided by any IT company of institute. 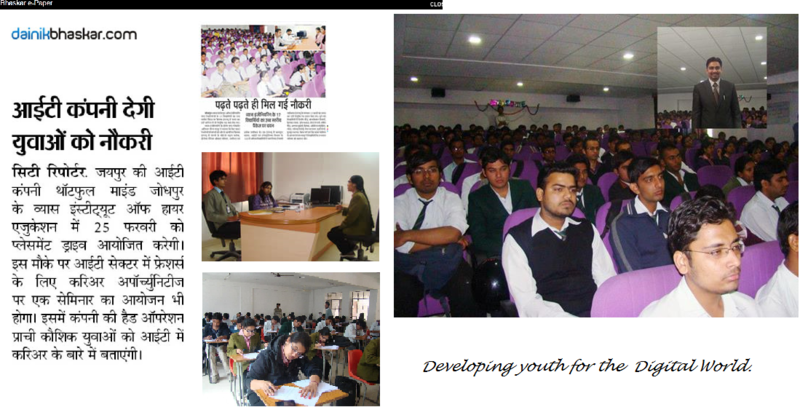 Why we say summer training in this IT company in Jaipur is entirely different, here are the reasons. As stated earlier also, we train to employ. For this reason we offer training in almost all areas we specialize. Keeping in view the increasing demand of E commerce business, we feel it is essential to know the power of Social media in promotion of any business. For this reason we offer training for SMO or social media optimization, SEO- search engine optimization, Digital marketing and Internet marketing. The best part is this training can be availed by students from any stream or branch and payout offered by these profiles is very high. Other than that, training in PHP and other open sources are offered to help students get into the field of website development. Again here it is worth mentioning that Thoughtful Minds is the best company to get training in website development for the simple reason we have the best portfolio for website development and that too of major groups or companies. Have a look on our website development portfolio. We let our trainees work on the Live projects and this gives the maximum exposure. Most of the companies or institutes offering summer training never let their students work on client’s projects rather they are either offered dummy projects or local servers. Finally, since we specialize in content writing, we offer training for journalism, content writing in Jaipur, India and the criteria is students from English Medium Background only. How to apply for training in Thoughtful Minds Web Services Pvt. Ltd? 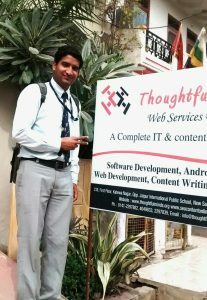 In order to apply for summer training or Internship at Thoughtful Minds Web Services Pvt. Ltd, you need to apply at training@thoughtfulminds.org with your resume. Moreover you can always call on the numbers available at contact us page to know if the opportunity to enter corporate world still awaits you. We welcome talent, either fresh or experienced. With the most professional work culture we need people like you who wish to stand out of the crowd. There are a number of vacancies available and you may have a look at our Job Vacancies page to know about them. For there only you can apply. Get SET to turn your FACEBOOK PROFILE STATUS FROM STUDENT/UNEMPLOYED TO WORKING AT THOUGHTFUL MINDS WEB SERVICES PVT. LTD.